College of the Rockies is pleased to welcome Graham Knipfel back to the College in his new role of Director, Donor and Alumni Engagement. 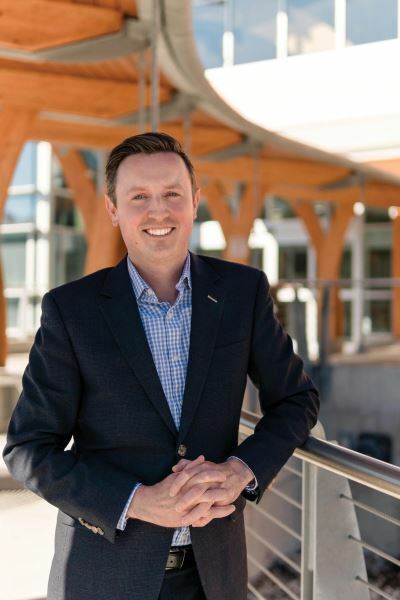 College of the Rockies Vice President, Partnership and Advancement, Pat Bowron, is pleased to announce the appointment of Graham Knipfel as the College’s first Director, Donor and Alumni Engagement. Working closely with community and industry stakeholders, Knipfel will lead the Donor and Alumni Engagement office, which has been established in an effort to keep the College’s students, graduates, alumni, and supporters meaningfully connected with each other and with the College. To enhance the College’s strategic focus on supporting students, this position is an investment that is integral to the future of the College, working with internal and external communities to create value for students and the East Kootenay region. Knipfel brings a wealth of experience working in the post-secondary sector, developing strong relationships with internal and external stakeholders, and working in fund development and grant execution roles throughout his career. Knipfel, born and raised in Cranbrook and a College alumnus, has spent the past 12 years working in the not-for-profit sector, including at College of the Rockies as Manager, International Projects and Partnerships, and most recently, at Camosun College as Acting Director, Camosun International. For much of his career, Knipfel has focussed on fundraising, partnerships, and regional and international development. He is keen to relocate with his family back to the beautiful Kootenays and rejoin College of the Rockies. "After spending a great deal of the past decade developing business and managing projects in Africa, Asia, Latin America, and the Middle East, I am thrilled to toss my suitcase away and relocate my young family to the East Kootenay - which is quite honestly the most incredible place on the planet," said Knipfel. "I am excited to return to College of the Rockies and to launch this new office that will foster community engagement and link investment to students. I look forward to re-joining an outstanding team committed to enriching communities through the power of education." Knipfel began his new role at College of the Rockies on March 18. To learn more about the College’s new donor and alumni engagement activities, email gknipfel@cotr.bc.ca. For more than 40 years, College of the Rockies has provided post-secondary education that meets the needs and aspirations of the people, industry and businesses of our region. Each year, we welcome more than 10,000 full-time and part-time students into a full range of programs, including: skilled trades, university studies, adult upgrading, early childhood education, health and human services, business, office administration, tourism, hospitality, recreation, fire services, continuing education and contract training. Through smaller class sizes, highly-personalized instruction and dedicated support services, our students are primed to succeed in the job market, or in the next stage of their academic journey.